You are here: Home › Stayfitcentral Health & Fitness Blog › Health & Fitness Blog › Buyers Guides › The Best Weight Gain Supplements For Rapid Results! Do you want to gain weight and build muscle? If so, this article is for you. After reading you will know the best weight gain supplements. When used as directed, they can help you add 10 pounds of muscle – or more – in just 4-6 weeks. If you’d like to get right to the products in this article, click on their links below to go directly their section. Otherwise continue reading below the list to learn more about how I gained weight and build muscle, our criteria for choosing these supplements, and much more. Beta Alanine – scientifically shows to help you gain muscle and train harder, longer. BCAAs – helps you gain weight by building muscle. 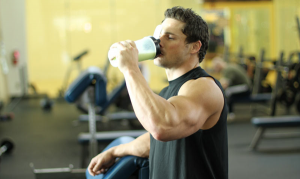 Creatine Monohydrate – can help you gain 5-10 pounds after 5-7 days. Protein Powder – make a high calorie, nutritious shake and gain weight fast. I know how hard it is to gain weight from personal experience. I graduated high school at 5’11” and 145 lbs. I looked and felt skinny. It was a bummer. I tried every weight gain shake and supplement on the market and rarely felt anything from them except bloated and tired. The products in this article – in addition to eating right and training hard – are what helped me finally put on 30 lbs. of extra muscle weight quickly, without making me feel sick, look bloated, or cost too much money. They’ll do the same for you, all it takes is using these supplements as directed and a little commitment and persistence, which I know you already have. All of the products in this article are backed by scientific research and thousands of user testimonials. They all also use high quality ingredients so you don’t have to worry that you may wasting your time and money on them. Here are the specific criteria I used. Reviewed the latest research and customer reviews to make sure it’s ingredients are proven to work. Tested the products out on myself and other Stayfitcentral.com lab rats to see how it works. Checked its ingredients to ensure it doesn’t contain unnecessary fillers or sugars. Read customer reviews to see what other people have to say about the supplement. Double checked to ensure that the company selling the weight gain supplement is reputable and known for selling quality supplements. What you won’t find in this article are weight gain supplements that are loaded with sugar. Many so-called ‘weight gainers’ have 100 or more grams of sugar per serving and a sprinkling of protein. Sure they have lots of calories but since they’re from sugar all you get from them is added weight from the extra body fat and water they make your body gain, not muscle. You also won’t find sports supplements that make crazy claims to increase your muscle mass by 1,000% in 2 weeks or something similar. We want to help you reach your goal of adding weight and muscle as quickly as possible. Working out hard is super important if you want to gain muscle weight instead of fat. This means lifting weights at least 3-4 times a week. These workouts need to consist of using the heaviest weights possible with ‘big’ exercises like deadlifts, kettlebell swings, pull ups, and squats. Taking a beta alanine supplement makes these things – and gaining weight fast – possible. Studies show that beta alanine supplements work by ‘buffering’ your muscles from fatigue during your workout. The longer it takes for your muscles to become tired, the more sets, reps, and weight you’ll be able to lift. Research shows that taking beta alanine for 8 weeks can help you gain over 2 pounds of lean muscle and lose fat at the same time (3). My favorite beta alanine supplements is Prolab Beta Alanine Extreme capsules. My reasons for choosing are that it uses ingredients that are backed by science, is convenient to take, and is affordable enough to take daily. Uses a patented and research-proven type of beta alanine called Carnosyn. Every serving only requires you to take 2 capsules. Other products require 2-3x as many. When taken as directed, one bottle will last 30 days. It doesn’t contain any fillers or other worthless ingredients, just pure beta alanine. 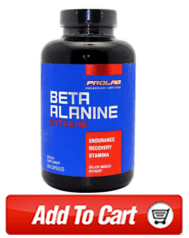 Click here buy Prolab Beta Alanine Extreme from our online store. According to the latest research, you’ll need to take about 3 grams every day in divided doses. You’ll get the best results if you take it in divided doses. After about 2 weeks you should notice you are able to train harder and get more done at every workout. Taking these ‘building blocks of muscle’ can help gain weight fast by enabling your body to train harder, recover faster, and most importantly, keep your body in an anabolic (muscle building) state all day long. Your body needs to be in this state throughout the day if you want to gain weight and build muscle fast. The BCAA supplement I recommend is Gaspari Nutrition BCAA 6000. Every serving (6 tablets) has 6 grams of branched chain aminos per serving. This is the highest dose I’ve found in a BCAA tablet. This way, you get your branched chain aminos in as few tablets as possible. It also has twice the amount of leucine per serving than other BCAA. This is key since it is the most important of the 3 BCAAs when it comes to building muscle. Highest Dose Available – at 6 grams a serving you’re getting the amount shown in the research to be necessary for building muscle and gaining weight fast. Convenience – get your daily dose in 6 tablets, not the 12+ other products require. Best Value – every can provides 30 servings. Competing products have half as many. Added B Vitamins – gives your muscles the nutrients needed to turn on the muscle building engines in your body. 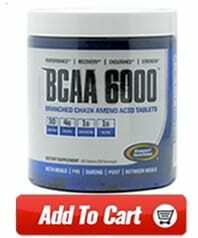 You can buy Gaspari BCAA 6000 at our online store. The key to gaining weight fast with BCAAs is to take the right dose at the right time. Taking 5-10 grams before and after every workout works best. As a general rule of thumb, the more you weigh and harder you work out the more you’re likely to need. This is the best supplement for gaining weight fast. When used properly, creatine can help you gain 5 or more pounds in 1-2 weeks. Best of all, none of this weight will be fat. Sure, some of it is water weight but research shows it’s not the kind that gets under your skin and makes you look bloated. It gets into into your muscles instead. This makes them bigger and, studies show, creates an optimal environment for building muscle. My favorite creatine monohydrate supplement is Betancourt Micronized creatine powder. It contains nothing but pure creatine monohydrate that’s milled into a super fine powder. This helps it dissolve easily in water, making it effortless to mix and drink. I also love this particular creatine supplement is that a single can lasts a couple of months and that each serving only costs 14 cents. Don’t believe the hype about supplements like liquid creatine, creatine ethyl ester (CEE), or creatine HCL. The research done on them shows that don’t work at all. Click here to buy Betancourt Micronized Creatine Powder at our store. In order for creatine monohydrate to help you gain weight it must be taken properly. This means first following a ‘loading’ phase where you take 20 grams a daily for 5-7 days. Research shows that this phase is necessary if you want to experience the most benefit. During this phase you should take your creatine in divided doses throughout the day. This will help you get the best results and avoid getting an upset stomach. After loading your muscles with creatine, you can cut back to 5 grams a day. This will keep your muscles filled so you to continue see and feel benefits. How Much Weight Can You Gain Taking Creatine? When you use creatine monohydrate properly you should gain 2 or more pounds by the end of the loading phase. Especially if you’re eating right and working out hard. The first time I used a creatine supplement I put on 5 pounds in 4 days. 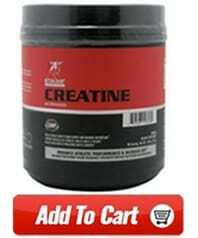 Creatine supplements can help you get stronger, faster and recover quicker between sets. These benefits make it possible for you to workout harder and as a results build muscle and gain weight. When choosing a supplement, make sure the one you buy uses only creatine monohydrate. This is because it is the only type that is proven to work. Dozens of studies show that when used properly, it works for practically everyone. Instead of drinking a weight gain shake with sugar as its main ingredient, it is better to drink a high quality protein shake that contains no sugar, and healthy fats. If you want to add a few hundred extra calories, simply add a tablespoon or two of almond butter to every shake. This gives you extra calories and nutrients from the healthy fats and proteins it has too. The protein shake I drink when I want to gain weight and build muscle fast is Paleo Protein by MHP. 240 calories per 2 scoop serving. 2 shakes a day has enough extra calories to gain 1 pound a week. 40 grams of protein. Per 2 scoop serving. High quality proteins. The two best protein for building muscle – egg and whey – are the only ones used. Delicious flavor. Both chocolate and vanilla taste great. Great value. 28 servings per container at a cost of only $1.29 per shake. 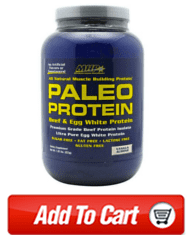 Click here to buy MHP Paleo Protein. The are a couple of things that makes this protein blend superior to others. The first is that whey and casein are digested at different rates. This gives your muscles both a rapid and then sustained release of amino acids, ensuring they always have the nutrients required to recover and grow. Their other major benefit is that both proteins have what is referred to as a high Biological Value (BV). This means that they are both well absorbed by your body and effective for building muscle and supporting your health. Since you want to gain weight fast, drinking 2-3 shakes is the best way to do so. This makes it possible for you to easily get an extra 720-1,080 calories daily from a high quality source. This is enough calories to gain 2 or more pounds a week. Best of all, these high quality calories won’t leave you feeling bloated, fat, and tired like sugar-filled weight gainers do. The best times to drink Paleo Protein shakes is between meals. This will help keep your body in a muscle building state. If want to get more calories from your shakes, make them with coconut milk instead of water or add a tablespoon of natural almond or peanut butter. Both of these options can help you get an extra 150 calories or more per shake. Now you know the 4 best supplements for gaining weight fast. When used together along with a good workout and diet plan they can help you pack on as much as 10 pounds in a month. In addition to gaining weight, they will also help you look and feel fit and strong which is all the goal we are all after.